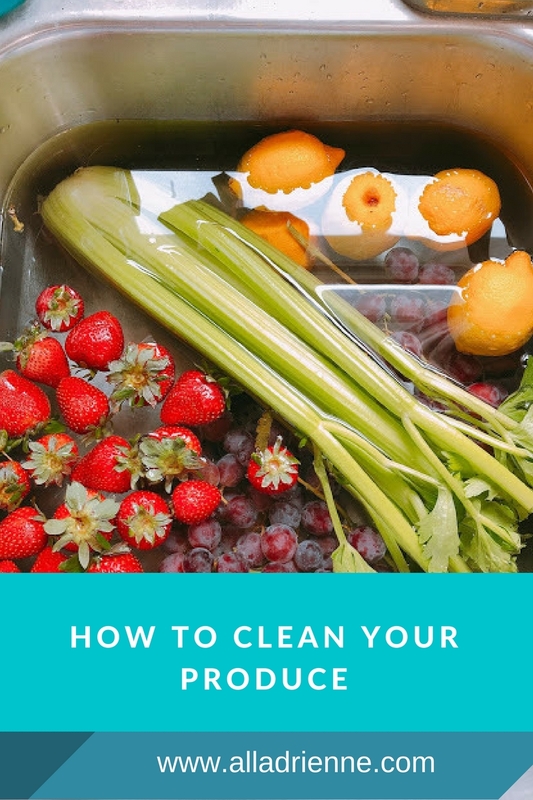 The most asked question I get over on instagram is how I clean my produce. Every time I come home with fresh produce I wash it before I even put it in the fridge. Between germs, dirt, pesticides, bugs, etc you never know what is on the food. Even just because something is labeled organic doesn't mean something didn't get on it in the store, during processing, or during shipment. I would rather be safe than sorry. Any produce, fruits and veggies, that we eat the outside gets washed. (lemons get washed before a slice goes in my water peel and all) After I clean the produce I also prep it for the week ahead. This makes for easier grab and go snacks, dinner making quicker, less waste and less excuses. Plus it only takes me like 10 additional minutes. BONUS: my produce actually last longer. 1- Fill cleaned kitchen sink half way with cold to luke warm water. Add 1/2 cup of Apple Cider Vinegar and 2 drops of thieves essential oil. 3- Drain sink. Rinse produce for a good 30 seconds with cold water. 4- Dry produce thoroughly with a kitchen towel. 5- Store in an air tight container (not the package it came in) or the drawer in the fridge or a bowl on the container depending on what the produce is.